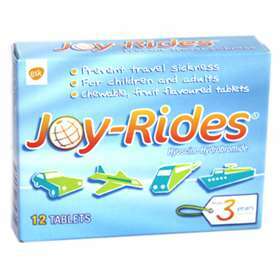 Joy Rides tablets are taken for the prevention of motion sickness. The active ingredient is hyoscine hydrobromide which acts on the brain to prevent messages of motion sickness reaching the stomach. Talk to your doctor before you take this medicine if you are pregnant or breast-feeding. Chew the tablets before swallowing. It is best to take Joy-rides tablets 20 minutes before you start your journey. See dosage on pack. Suitable for age 3+. If you take too many tablets, contact your doctor or casualty department. Tell your doctor if you get dry mouth, dizziness, blurred vision or difficulty passing urine. If you do get any side effects, even those not mentioned, tell your doctor or pharmacist.